See Sider Squirm. If Pope John Paul II is really interested in dealing with heretical “liberation theologians” in his church, then he ought to issue this third edition of Productive Christians as a Papal encyclical. Protestants have trouble with their own liberation theologians. Some of them are Marxists in the Lamb’s clothing, while others are merely Fabian socialists in the Lamb’s clothing. Some of them just aren’t willing to say…yet. (Tactics, you understand.) Ron Sider belongs to the third group. Sider’s first edition of Rich Christians in an Age of Hunger created a minor sensation in conservative Protestant circles. It was the cutting edge of a radical shift of political and economic opinion in the neo-evangelical world, especially on college and seminary campuses-a shift to the far left. The book received no response until 1981, when the first edition of Productive Christians blew away Sider’s claims that he was simply applying the Bible to economics. Sider has never recovered intellectually, as Chilton’s third edition demonstrates. 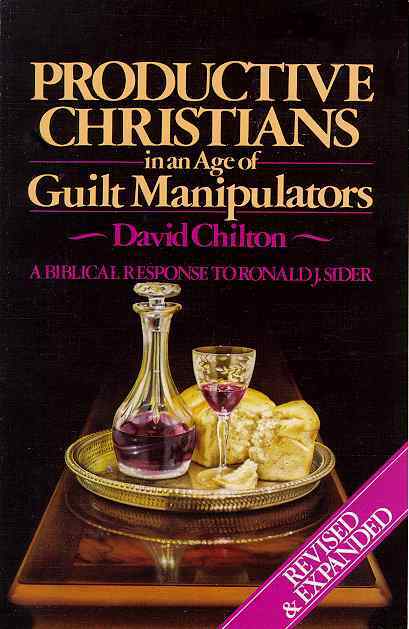 Sider’s desperate attempts to “cover his flanks” in the second edition of Rich Christians are exposed by this book as a last ditch effort. Sider waffles, Sider squirms, Sider drops whole sections of the original book, Sider changes a few words and quietly shifts controversial sections (exposed in Chilton’s earlier editions) to other chapters, but still nothing works. There is no place left for Sider to hide. Chilton makes it clear: Sider understand neither the Bible nor economics when it comes to his conclusions about profits, taxes, foreign aid, and Western guilt for the Third World poverty. To put it bluntly, this book definitely destroys what little was left of Sider’s position. The Sider phenomenon, intellectually speaking, is finished. This book is its gravestone.